Yes. Also, #3297-98 are rehabbed. Whoa!! I wonder has the digital run boxes issue been addressed? It's the only reason I can think of for a hiatus. As demonstrated, that isn't significant enough to hold up anything. I have to agree with Busjack because if that was an issue, then the rehab would've went to a complete hault. Also, I seriously don't think it was part of the contract. All the various components (destination sighs, hvac, materials for rebuilding propulsion components, etc.) were separate contracts. It's up to shops personnel to put it all together. The only other problem they had was all the blue light defects they were having on the equipment early on, but they seemed to overcome that before the hiatus. Could also have been trouble with parts delays, defects etc. I doubt they were all on vacation. I had a few questions and wondering if anyone had information towards my questions/observation. When they release a rehabbed couple and add it to service, why are they placed as belly cars? Just recently they started to let some of these rehabbed couples become leads. 3343-3344 and 3357-3358 have been lead cars recently within the past month or so and I think there is another coupled set that's also a lead. But almost all of the other cars are belly cars along with the red tape and a 'stop sign sticker' on the window of the cab. I haven't seen the sticker up close yet but as they pass by I can see that they're in the cabin. Was there a delay in the process of handling the rehab project? I also noticed that (possibly assumed) brown line equipment might be shorter than counted because for the past 2 months or so they haven't cut the cars down to 4 during non-peak hours like they would normally. I'm not entirely sure if that's their (CTA) new protocol with the brown line because, I haven't ridden it at a later time yet but the latest I've been on it comparable to the orange line, it's 8 cars only. Sounds like to me it is an ATC issue. When the ATC is not working, that pair of cars become belly cars. One thing you can look for is these orange or red tags on the outside grab bars that you would place your hand on if you were to climb up from the right of way. There on the lower ends. That is what that means. Why cars are coming out with defective atc I don't know, maybe it's just a safety protocol. It at least beats the blue light defect which puts the pair in Kimball yard!! Just spotted a nicely rehabbed 3205-3206 heading north on the Brown Line. 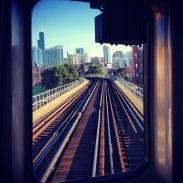 Damn the orange line has new rehabs finally!! #3217-18 rehabbed a while ago but it's on the Brown Line roster. I was on the Brown Line earlier today, and the left rollsign on one of the unrehabbed #3200-series cars kept rotating every few minutes in a random pattern. It'd stick on Linden for a while, then rotate (seemingly on it's own) to Kimball, then to half of a Howard, etc. What usually controls the rollsign movement, and why was this one spazzing out? I remember @briman94 discovering that the roll signs on the 3200s move when some operators use abnormal methods to override the ATC penalties without use of the ATC bypass mode. The signs would move out of place, and then move back to their normal position (Kimball or Loop). On some 2400s, getting temporarily gapped at railroad crossings (like on the Purple and Yellow Lines) would cause the roll sign units to start scrolling in a direction (I'm not sure if it's the same direction every time). After the train contacted the third rail again, the signs would scroll back to their selected position. I have personally witnessed this on the Skokie Swift, and there is a video of a Purple Line set of 2400s exhibiting this behavior. I know I haven't been on this Thread or other Threads in a long while after months. Once when the entire 3200s are done with rehabs, will it be the end of remaining 2600s that are on the Orange Line to Scrap? Very unlikely. Aside from that the Midway Yard car allotment was increased to cover Brownage runs, someone posted in the 7000s thread a Railway Gazette article that the firm order (if it ever gets past the protest) was increased from 400 to 490.The only reasonable conclusion from that is that 490 2600s are to be replaced by 7000s. RTAMS says CTA has 527 2600s.Personally, I don't know why CTA now needs 1498 cars, when, before the acquisition of the 5000s, there were 1190. Sure there were some increases because of the Red and Brown Lines, and some promised this fall for the Green Line, but that many? I wonder if they're cutting corners on the rehabs. I see more and more 3200's with the LED destination signs, but they still have the fluorescent lights still, not the LED ones. To me, it wouldn't make sense to put the LED signs in and not do the LED lighting at the same time. They are different supply contracts, and it appears that the destination sign installation was always independent. But almost all of the other cars are belly cars along with the red tape and a 'stop sign sticker' on the window of the cab. I haven't seen the sticker up close yet but as they pass by I can see that they're in the cabin. To confirm, I got a partial glimpse of a stop sign sticker the other day... it said "Equipment must not be ____ed as head or read car". "Equipment must not be used as head or rear car" - account nonfunctional cab signal. This has never kept a car out of service, as sometimes parts take a LONG time to get, just can't be on ends of train. The extra cars are enough to put together 38 eight car sets and one four car set. So the question becomes did Red and Brown Lines increase by about 30 runs plus relevant spare ratios? Very likely not. But the quick answer might be that CTA may be thinking they'll probably have service expansions beyond the stated ones for Red, Brown and Green especially if by some miracle the extension on the Red to 130th actually becomes a reality beyond plans on paper. So the question becomes did Red and Brown Lines increase by about 30 runs plus relevant spare ratios? Need for Ravenswood could originally be calculated that Kimball Yard had 144 cars when 6 car trains were run, so it would have to be increased to 192 to get it up to 8 car trains (some now Brownage). Presumably why the original base order of 206 was to replace less than 140 2200s and provide the 48 additional cars for that purpose. The actual notice to proceed was increased to 406, presumably to cover the 2400s. Notwithstanding that, the retirements were about one series short. Thus, as you offered, the rest has to be for more runs or spares, I don't have info on the number of runs then and now to justify the 260 cars. RTAMS.also indicates that Blue Line has 394 2600s. Blue Line used to run something like 340 cars (140 2200s and a bit less than 200 2600s). Maybe having junk bloated it, but if anyone was thinking anything, need on the Blue Line should be reduced because something like half the trains are short turned. Since the 308 option 5000s effectively replaced only 73 2600s (and CTA probably wrecked most of them; I can think of 24 in the O'Hare and Harlem-Eisenhower cases), and the Railway Gazette article said that CTA is taking 490 7000s (presumably to replace the existing 527 2600s) the intent to have 1470 cars on existing routes seems permanent. The original 846 allocation for 7000s was the last two options totaling 190 was for "expansion," but, in effect, CTA has exercised one of those options already. Probably the high anount of cars on the blue are due to the high demand and not so reliable/old cars. Dont really know why green has 190 vut it could have to do to consolidation. Cta has gone out of there way to make the lines uniform. So if that leaves many spares that may be why. Strange how the orange line is keeping its #2600's its like they dont even want to go their with a mixed fleet. thought I might have seen a fully rehabbed #3275-76 today and possibly #3295-96 rehabbed now as all one unit instead of just #3295 but I couldn't be sure. i need to double check it. #3275-76 is confirmed unrehabbed. #3396 is in kimball yard though so it sounds like #3295-96 is right. 2600s and 3200s are compatible with each other, so it isn't much of an issue for the Orange Line to operate both. 5000s on the other hand are not compatible with 2600s nor 3200s due to the use of AC motors. My guess is CTA is trying to stay away from a mixed DC and AC fleet on the Orange Line.